This week was packed full of making memories with the kids before school started back up. I took a bit of a hiatus from blogging to spend the last week swooning over my babies. I only have two outfits this week but they are both great looks on a budget. Two entire outfits put together for under $16.00 each – who says a mom on a budget can’t look decent? My Pinterest style this week was from a pin that came from Modedaemour. 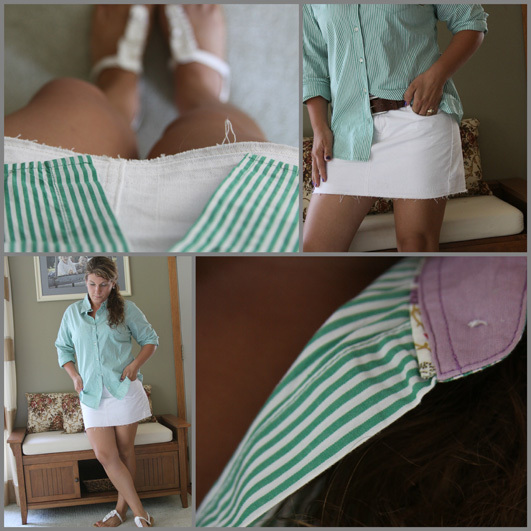 Her simple striped tailored shirt, white skirt, and brown belt were the perfect combination for a classy summer style. Tuesday: Dropping the little guy off at his first day of kindergarten (tears) and grocery shopping with the little lady. Yet another t-shirt and jeans combo that I am most comfortable in. This outfit includes one of my favorite pair of jeans that I found at Goodwill for $6.00. I love how much wear I am getting out of them – especially for what I paid for them. I love this fun off the shoulder tee that I found at TJ Maxx. 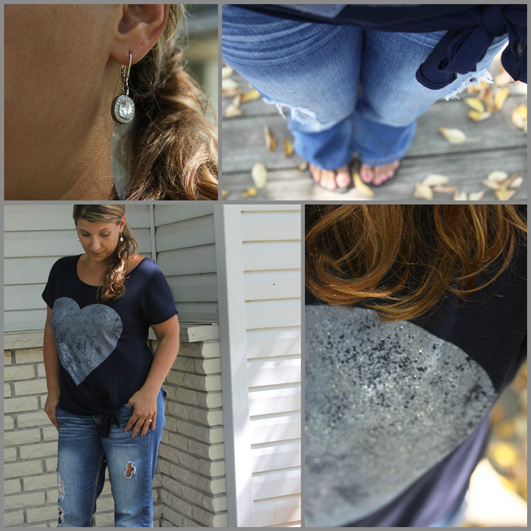 The silver glittery heart and comfy fabric make it as fun to wear as it is comfortable. Hair: My good friend the sock bun created the overnight curls without heat so that I could wake up and style my hair in the morning in about 5 minutes. I added some volume to the top and sides, and put in a simple side pony. I wrap a piece of my hair around the hair elastic to polish off the ponytail and make it look more finished. Cute outfits! Love the colors in the first outfit and the heart tee in the second.